Yesterday, Sean Spicer said that Hitler, “didn’t even sink to using chemical weapons.” It was completely wrong and he apologized. One version of Spicer’s apology was posted on Facebook, and it appears to be just as offensive as his original statement. The only problem? It’s totally fake. 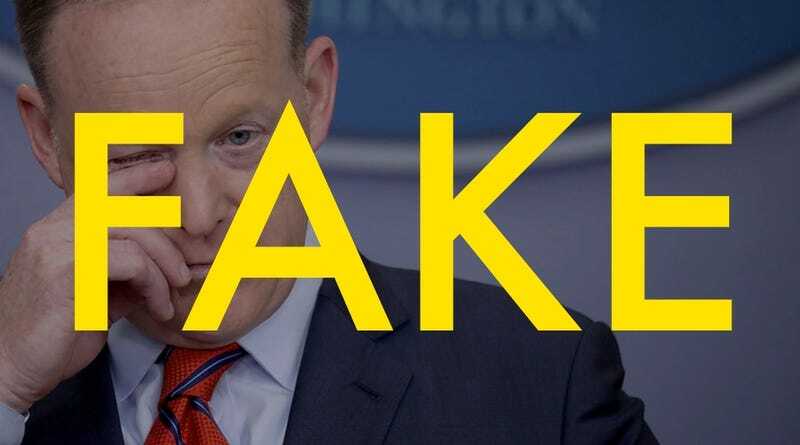 The doctored apology appeared on a now-deleted Facebook page called “Press Secretary Sean Spicer.” As James Cook from Business Insider UK points out, the Facebook post was a total hoax and isn’t run by anyone associated with the White House. But that hasn’t stopped the fake apology from being spread far and wide on social media. People who saw the message and didn’t realize it was fake were rightly upset, as most of the people that Hitler gassed were his fellow Germans—German Jews, among a host of others. As often happens, the Facebook post was passed around on other social media platforms like Twitter, where it spread even further. But again, despite the fact that what Sean Spicer originally said was completely wrong and there are rightfully calls for his resignation, this particular Facebook post was a hoax. In no way was I trying to lessen the horrendous nature of the Holocaust. However, I was trying to draw a contrast of the tactic of using airplanes to drop chemical weapons on innocent people. So, yeah, Spicer should still probably be fired. But not because he said Hitler never used chemical weapons against fellow Germans. He simply didn’t say that. Spicer should be fired because he’s bad at his job in every way, shape, and form. Do you want to see a fake that’s actually funny? Someone spliced Spicer’s press conference idiocy into a closing credits sequence for the HBO show Veep. Now, that’s funny. Well, it would be if it wasn’t so terrifying that our reality is literally worse than an episode of a satirical show.